Check envelopes need to be tamper proof and very secure, and that is exactly what we are offering. Our check envelopes have been professionally designed to suit the most important needs and security levels needed for a check envelope. We endeavor to protect the privacy of the checks by tinting the envelopes and providing a double window where sender and recipient address/information can be seen. Aside from buying for your immediate check envelope needs, buying in bulk always comes with advantages. Our special offer of 1000 QuickBooks checks + 500 self-seal envelopes enables you to save a lot while not risking running out anytime soon. 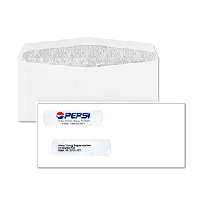 We still offer check envelopes in other quantities to meet your needs. Having to buy check specific envelopes for each check type you have can be cumbersome and relatively expensive. Our check envelopes are designed to cater for all computer checks as they are all tinted. Additionally, the check envelope is made of high quality wove paper, ensuring that they don’t compromise the contents en route to the payee. 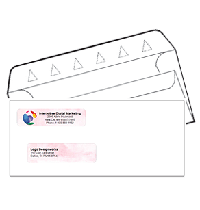 Self-Seal – - with this kind of envelope, a surface beneath the flap is folded to hide a surface with an adhesive. Once you have slipped your check into the envelope, all you have to do is flip the folded part, and bring down the flap for a tight tamper proof seal. 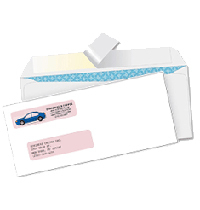 These checks envelopes are ideal for professionals and businesses at large. They are easy to use with the self-sealing feature making them hygienic and efficient. You don’t have to apply any adhesive or water in order to seal the envelopes, rather you only need to press the flap onto the envelope and it will be securely sealed. 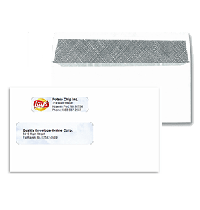 Peel n seal – – These kinds of envelopes have a flap which has a strip which you need to peel to reveal a sticky surface. All you have to do is quickly press onto the envelope for a secure seal; no adhesive or water required. Regular Check Envelopes – - Your standard Double Window Security Check Envelopes, with the same security features as our other envelopes. Envelopes For Wallet Checks – - This double window security wallet check envelope is custom designed to fit your wallet size checks and only comes in a regular style, not flip or peel n seal. Here at business checks online, we served many customers for a long period of time, and they will confess that our check envelopes are perfect for computerized checks. Not only are our check envelopes designed to withstand the wear and tear during delivery, but they are also very affordable. If you take on one of our offers, you get better quantity and quality for the money. Privacy is a priority and is ensured first by the double window feature that allows only the sender and recipient details to be visible and then by the tint. Secondly, the tamper proof seal further enhances on security and you will know if anybody tries opening the envelope, look no further for all your envelope needs!